Along with the classics they are bringing a range of new products too. The main stand out for me were the new ‘helix’ products – the pigment is held in a floating helix in the tube and merges together when dispensed. All very pretty as you can see from the pic! 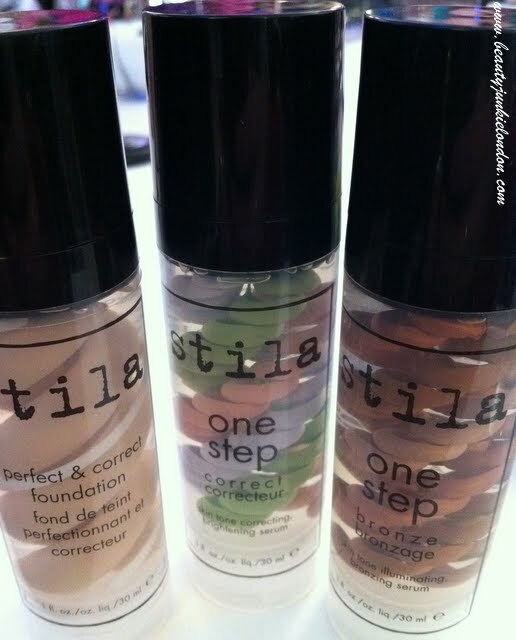 L-R: Foundation, Colour Correct Primer, Bronzer. I absolutely adore the bronzer (on the right) – it looked intimidating for a pale-skinned person like me. But blended into skin like an absolute dream. Leaving skin with a natural looking bronzed glow, that felt light, like a gel. Much more natural looking than a powder bronzer. The bronzer costs £24 from the various online retailers I checked out (list to follow at the bottom of the post). In the triple helix range of products there’s also a ‘perfect and correct’ foundation (I tried this on the back of my hand and it blended really well with decent coverage) and a colour correcting primer. The primer looks the prettiest as the three colours (lilac, green and peach – in the middle of the picture above) are held separately and then blend to a mixture of complexion-complimenting shades to apply to skin to prime for foundation. 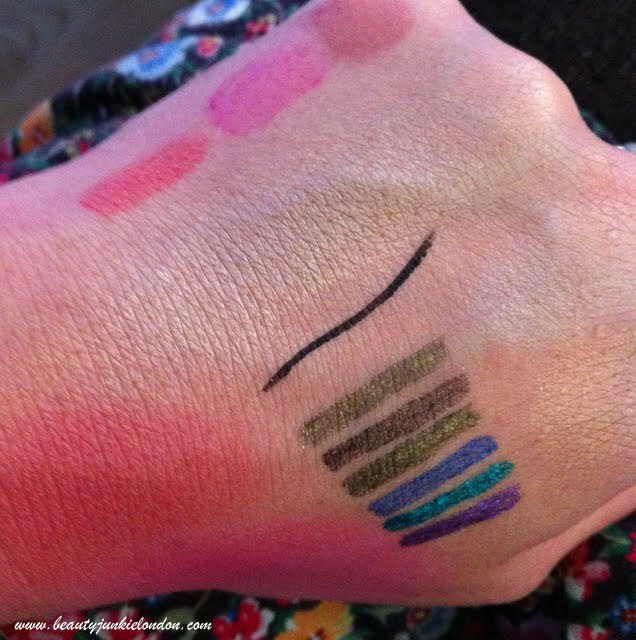 Just for fun, here are some of the swatch snaps from the back of my hand at the launch event! All a bit of a rainbow coloured mess, but the swatches include the glitter eyeliners (amazing, totally wont budge once dry) the lip stains, kitten eyeshadow, colour adapt blush…. Soon to be found at beautyexpert.com, HQhair.com, and in Boots Beauty Stores (cannot wait for these) and ASOS.com from July. 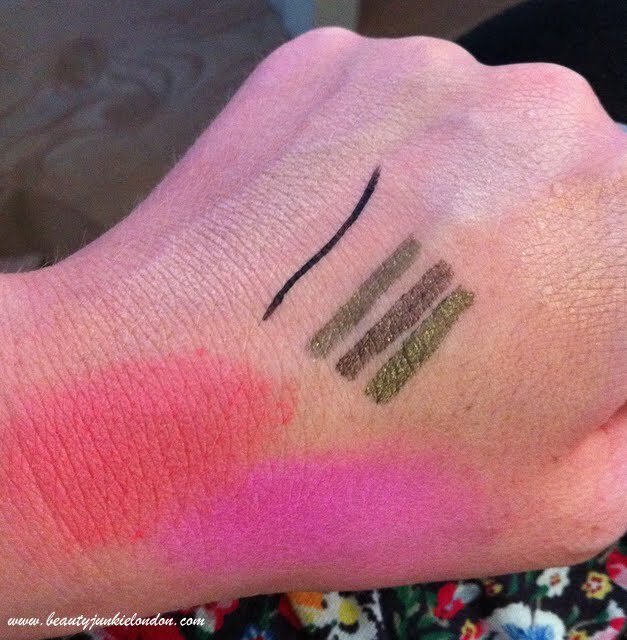 @miss_violet It is indeed – the two big, bright swatches are the self adjusting coral and self adjusting pink blushes. Both very pretty! @miss_violet I think I’m going to have to try the colour adjustic coral too. I love coral blush, and would love to see how it adjusts to my skin tone! If you try it, let me know how you get on!